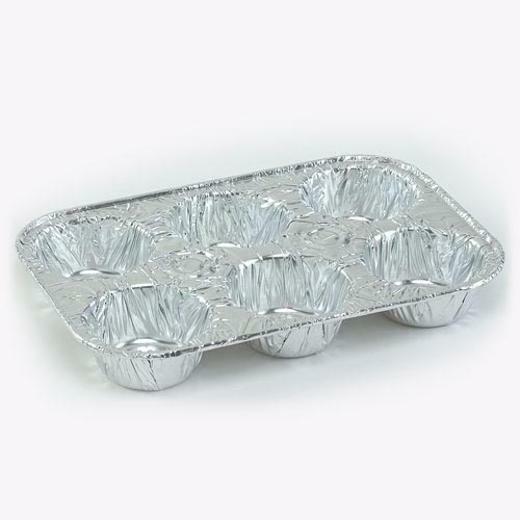 Baking muffins or cupcakes just became a whole lot easier with this aluminum 6 cavity muffin pan. Forget about scrubbing your muffin pans clean ever again with these convenient and easy-to-use trays. There is space for 6 muffins per aluminum pan and now space in your sink for washing all your other dirty baking utensils. Made in the USA. 9.5 in. x 6.5 in. x 1.5 in. L: 9.5 in. W: 6.5 in. H: 1.5 in.